Dubai: Champions Flamengo want to do an encore in Dubai, and all in memory of their teammates who perished in the club’s dormitory fire earlier this year. 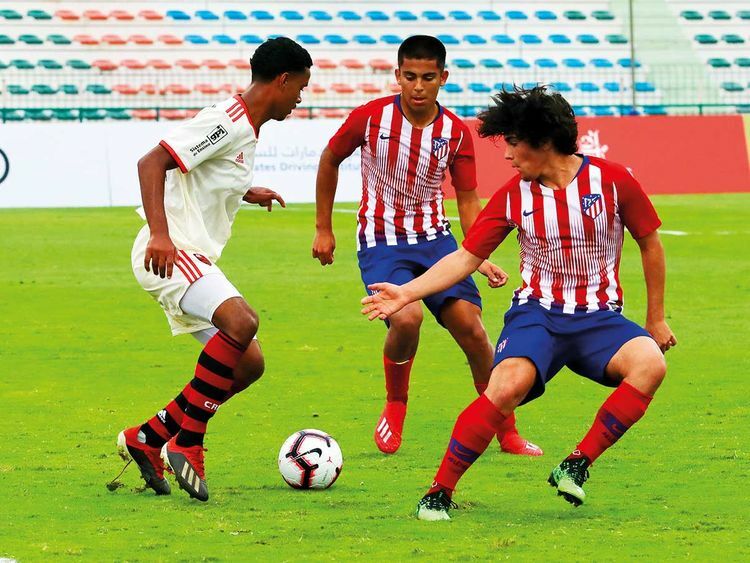 Coming in as hot favourites, the defending champions from Brazil were on song scoring two goals apiece on either side of half-time in their 4-0 thrashing of Spain’s Atletico Madrid on the second day of the Ninth Dubai International U16 Football Championships being played at the Shabab Al Ahli Dubai Club ground in Al Mamzar, on Thursday. After picking up full points to begin their campaign here, the players hugged each other and trooped off the pitch with their heads hung in sorrow. “This is the best we could have done to honour our departed players. This win was for them, and we promise it won’t stop here as we intend to replicate what our team achieved here last year,” Flamengo coach Mario Jorge told Gulf News. A fire had engulfed a dormitory at the Flamengo youth team’s training centre in Rio de Janeiro in February killing 10 teenage players. The victims were all staying at Ninho de Urubu, the training ground of Flamengo in the Brazilian seaside city famed for its Copacabana and Ipanema beaches and the statue of Christ the Redeemer atop Mount Corcovado. Of the 10 dead in the fire — most of them aged between 14 and 16 — defensive midfielder Rykelmo Viana was part of the side that beat Spanish giants Real Madrid in last year’s final. Another three — Samuel Rosa Thomas (right-back), Jorge Eduardo (defensive midfielder) and Christian Candido Esmerio (goalkeeper for club and country) — would have been in Dubai along with the squad this week. As a tribute to the victims, the team played against Atletico Madrid with black armbands. “We remember all of them,” Jorge said. “They were part of our family. There is every reason to be happy with a win, but today’s win is more significant as we have done it for those who couldn’t be with us here this week. One of Brazil’s biggest and best-known clubs established 123 years back, it is estimated that Flamengo has a fan base of more than 32.5 million. Best known for the legendary Zico, Flamengo’s main team ended runners-up in the Campeonato Brasileiro Serie A league last season. The club is also proud of the tradition of its youth academy that insists on its motto of “making our star players at home” that over the years has seen the likes of World Cup winners Ronaldinho, Bebeto and Romario following in the footsteps of the legendary Zico. “Christian was already the national team goalkeeper and perhaps he could have been a legend like so many others before him,” Jorge said.